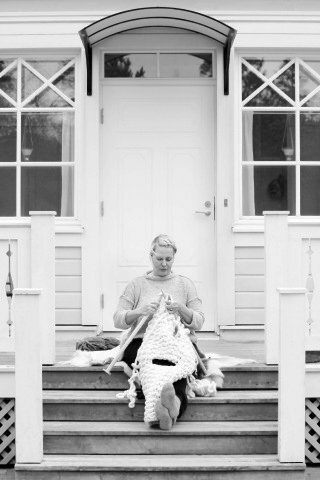 Double your pleasure, double your fun: Maria Leivo, TJOCKT founder, with wool. Running a successful business while keeping your roots and values is not easy. But it’s a feat that Maria Leivo, CEO and head “woolwoman” at TJOCKT Yarns, has done. TJOCKT produces delightfully fat and cushy yarns from Finland. We’re so pleased to launch our shop and knitting kits with TJOCKT’s Martta the Merino yarn – a bulky super soft merino yarn in a generous 140 yard skein. Check ’em out in the shop and get to know TJOCKT in our Q&A! Maria Leivo, founder of Tjockt. Hei* Maria! How did you start TJOCKT? TJOCKT was officially started in April 2013 in an archipelago of Finland. During the previous Fall I had been looking for giant yarn for our living room carpet, but I could not find any. After a while I got frustrated and started testing different techniques and developing machinery for producing the yarn myself as I am an engineer. After a few months of working I finally had a machine that I could use to make this giant yarn. And that’s how it got started. When I posted the first photos of my creations I started to get inquiries about the yarn. Others wanted it too! Quite quickly I put together a selection of different materials and colours, and TJOCKT was born. Do you run TJOCKT on your own? I am the head woolwoman at TJOCKT at the moment. I do practically everything, from spinning the yarn to packing and marketing. But I’m trying to focus more on the customer and reseller side of the business as well as development and sales. At the moment, TJOCKT employs 4 to 5 people. TJOCKT’s fat and fabulous yarns. 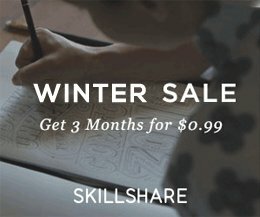 How do you make your yarns? The yarn is produced in our shop in Parainen, Finland. We order the wool from responsible wool suppliers and sheep owners. We then spin the yarn, and afterwards fat yarns are felted slightly on the surface to make them more resistant to wear. Many of our yarns are used in rugs, blankets and other interior textiles, so they have to tolerate use and still look good. 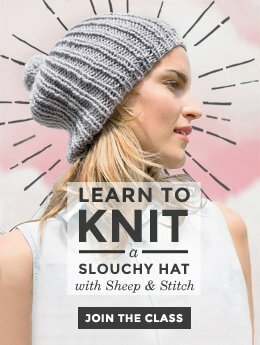 Where does the fleece come from and how is it spun? The fleece and wool comes from different places. We aim to promote Finnish sheep owners. Finnish sheep have beautiful fleece, but we don’t have merino sheep in Finland, so we source the fleece from responsible wool suppliers who have certified wool. We are against mulesing and we only use wool that comes from certified partners. Angora rabbits! How do you fleece them? I keep them in my lap or on a table and cut the fleece gently with scissors. Our rabbits stay in a large fenced yard outside where they are able to eat grass and smell the wind. We move them inside when the rains start or when it starts snowing. 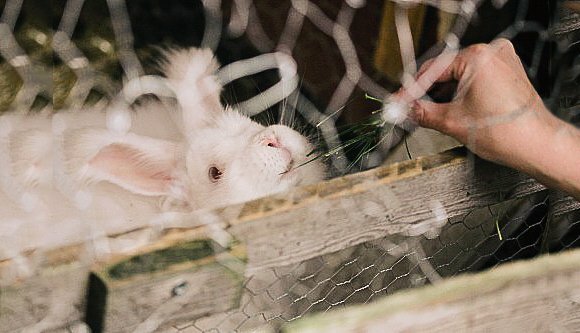 Last winter I saw a lot of nasty videos where angoras were shed by ripping the wool off the rabbits, and the rabbits were kept in cages like shoe boxes. That is so cruel, and no animal should ever experience that. The sad thing is that this has changed how people see angora wool. It’s gone from a wonderful, luxurious fleece to something perceived as sad, dirty and unethical. I want to change that. Angora fleece has absolute premium wool qualities and it is so fine and warm that it has no comparison. Even cashmere is no contender. What’s the best part of running TJOCKT? Being creative. I love running my own business because I can decide the things I want to do, and I can create the products I like myself. I’ve designed all the knits, and the creative part of the work is wonderful. I am not so into finances but it is something that just has to be done. Thanks for enlightening us, Maria! We’re so happy to be carrying TJOCKT’s Martta the Merino in our shop. Keep rockin’ it! 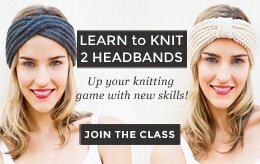 I just saw amazing designs of knitted crafts. The most important thing was that they knitted for disabled persons, and this day there was mostly socks and mittens on the needles.